Grains weaker in the overnight after Monday’s rally. Wheat is down a nickel, corn is unchanged, and beans are up 4 cents. Yesterday’s U.S. weekly export inspections had wheat exports 17% behind a year ago with the USDA forecasting a 14% increase on the year. Corn 80% ahead, up 1 %. Soybeans 42% behind with an 11% decline forecasted. According to U.S. Agriculture Secretary Sonny Purdue, China will likely begin buys U.S. beans around Jan 1 due to limited supplies in Brazil. This comes after cutting imports from the United States due to the U.S.- China trade war. China will need to drop tariffs imposed on a range of U.S. ag products earlier this year before it can fulfill the promise to begin buying a substantial amount of U.S. goods, said Chinese traders. Brazilian soybean farmers anticipate a drop in prices if China lifts tariffs on U.S. soy in March, when new trade terms between the world's two largest economies may be disclosed and South American nations will be collecting another bumper crop. USDA says 5.49 million tons of U.S. soybeans crushed on October. Trade estimate was for a crush of 5.488 mln tons. 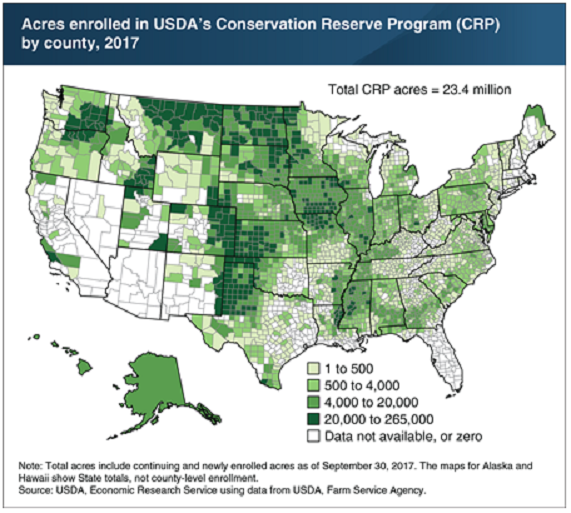 USDA’s Conservation Reserve Program (CRP) covered 23.4 million acres at the end of the fiscal year for 2017. Individuals enrolled in the CRP program agree to take land that is sensitive to erosion from wind or rain out of production for 10 years or more. Enrollees receive annual rental and other incentive payments for participating in the program. A large share of CRP land is concentrated to the Great Plains where there is limited rainfall and land is subject to wind erosion.